The flood waters have receded enough for the trains to run once again, and life seems back to normal for most of the city residents. Thanks to the kind e-mails from readers who asked after our well-being - we were very fortunate not to be affected by the floods, unlike so many others who have to cope with the damage. Of course, the worst we suffered here (some houses without power, some damage to furnishings) is truly insignificant in comparison to the tragic impact of the flooding rivers in Mainland China last week, which the BBC reports as rendering 450,000 people entirely homeless, while 650 people are known to have died. When the British insurance agencies write at great length about the agony they experience over paying the monetary claims of their customers, one must put it into the context of the true suffering occurring in Sichuan, Shaanxi, Hubei, and Anhui provinces. The photograph shown here of the fragile purple flower covered in raindrops [taken by WJ in the University Park - many thanks] seems particularly poignant. Like the photographer of the purple flower, the Dianhong [Yunnan red] teas described below are also from Beijing, having been acquired by Lei on Maliandao. "Youji Hongya" [organic red-tip] is 55 RMB / 100g [£3,$6], while "Hongyawang" [red-tip king] is 40 RMB / 100g. 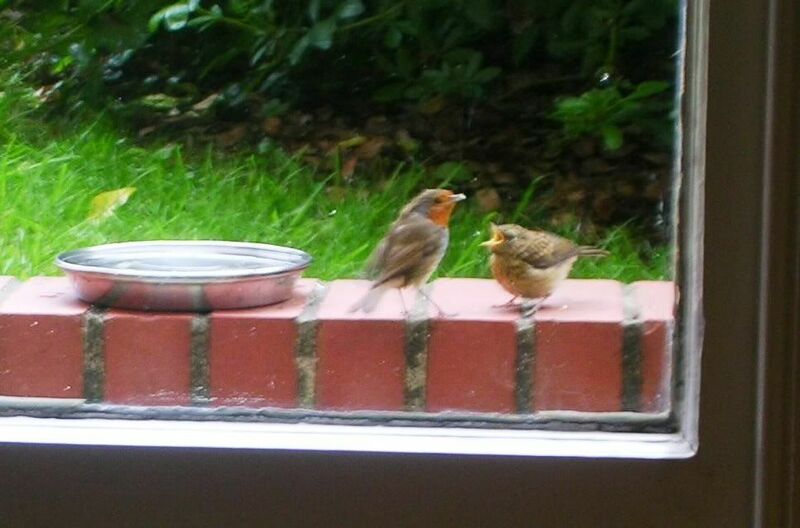 These two appear left and right in the accompanying photographs, and will referred to as YJ and HYW, respectively. The same brewing parameters were used for both teas. The YJ is almost entirely made of small, yellow tips, the first pick of spring. The HYW is made of large, sultry tips (perhaps left to age on the bush, in comparison to the YJ), and is mixed with some darker leaves, representing its slightly lower grade. Both brews appear identical, being the classic deep amber of Dianhong. Though the claims of the YJ to be organic are laudable, I was a touch disappointed in it: though malty, tangy, and sweet, as one would hope from a Dianhong, it lacked much excitement. It has a decent texture, but is not the pure luxurious silken experience that we found with the 2006 "Gold Tips" or (to a lesser extent) the 2006 "Pure Buds", both from Yunnan Sourcing. There is little ku, and not much in the way of huigan. The HYW, by comparison, was higher and clearer in its flavour, with a definite enervating sensation to be experienced on the surface of the tongue. 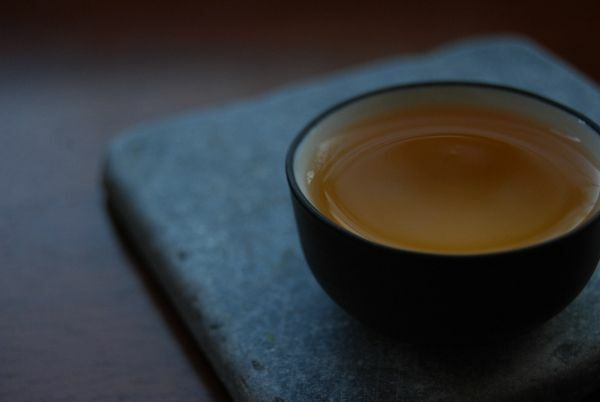 It was a particularly lively tea, and exhibited the full-bodied appeal that I like to advise people to look for in a Dianhong. YJ: Some stems, some broken leaves, some tips. HYW: Big and beautiful, with no fragments at all. Though the YJ was the more expensive tea, the HYW was by far the better. I like to try and learn something from every tea session, and this was an interesting lesson in the possibly inflated prices that "organic" teas can attract. I use speech-marks around the "organic" as the entire notion of organic certification is, to my understanding, a mutable concept in the current production environment of Mainland Chinese teas. I have heard tell of several certified-organic producers who revert to more conventional (read: inorganic) treatment methods once the qualification has been achieved. Certainly, I have heard such stories in sufficient quantity as to invoke a healthy degree of caution when listening to the claims of tea producers. In the spirit of our fortunately verdant surroundings, we have been enjoying various tieguanyin so kindly provided by Chabei's JMcM [see earlier]. Today's notes comprise two of our favourite encounters. Of course, dahongdai [big red bag] is our ad hoc label for this nameless tea, and not a real leaf name. Very green; generally smaller, single-leaf balls, with some larger indicating the presence of several leaves within. "A more grass-like aroma." "The flavour is just like honey." Sweet it is, but more gradual and gentle than the previous "Dajindai". "Amazing - a very strong orchid taste in the mouth." Trying to find some orchid in it, I reply, "What is it with Chinese people and orchids? Do you eat flowers?" As ever, the soup starts out lightly green, and then includes a yellow hue as the basic leaf begins to assert itself, accompanied by a corresponding sourness in the flavour. The scent is constantly beautiful throughout the long life of this tea, unlike even the most expensive Taiwanese gaoshan wulong we have encountered in the past, which seem so ephemeral in comparison. Large, feeling healthy and strong without being tough. Edge-damaged for oxidation. An orchid tea, but classically tieguanyin. The endurance is noteworthy. Another good tea from JMcM. Xiaozidai is "little purple bag", in this case. Seriously large balls of tea. One good aspect of this sized ball is that there are less likely to be small, fragmented leaves within. The soup looks like lime cordial, being translucent and green. "The leaves smell super-green!" The wenxiangbei lasts for whole minutes, and is a big, bold sweetness. A long, creamy flavour sits in the mouth - just like a serious farmhouse cream. This is less about being floral in the nose. In the second infusion, and for the remainder, a solid, nutty flavour comes to the fore, and it takes on a certain "rock-like" quality of yancha [rock tea], with its mineral, charcoal edge. "It tastes more and more roasted." Though the roast is not dominating, the way a brashly roasted Wuyi yancha might be, it becomes stronger and more noticeable - fortunately not pushing the wulong flavour out too far. The leaves are bursting to escape their small volume. They are 3cm whole leaves, with a few stems. It is a decent grade, if not the finest, but no sign of the unorthodox roasting can be seen in the leaves. A curiosity indeed, being a pleasant wulong sent more to the yancha "Dark Side", without being "nongxiang". 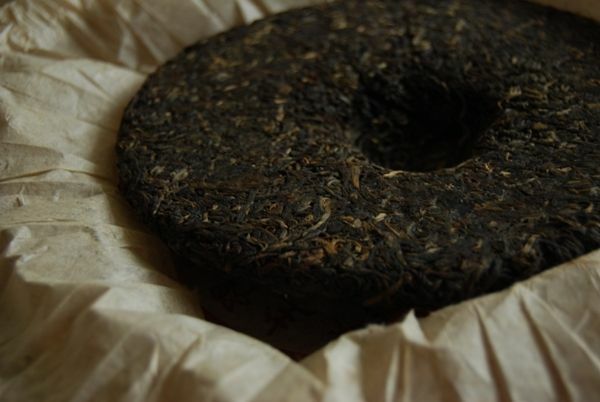 A sample from DL [thanks muchly], this shupu tuocha sells for around $38 at Royal Puer - the 2005 is alleged to have won first prize in the 13th Shanghai National Tea Culture Competition in 2006. I remain skeptical about accolades from "tea competitions"! Farily pretty, for the usually-homogenous shupu, being fairly large, with recognisable fragments of large leaves. The compression is unusual, being not too tight, allowing these large leaves to come apart quite easily, with minimal breakage. This strikes me as a shupu produced with respect for the leaves, which is quite unusual (which I state as one who enjoys shupu). A rich red-gold soup, with a decent fresh aroma. The flavour is rich, yet not overpowering. There is little in the way of huigan, but the shupu flavours are crisp, clean, and the texture is fairly smooth. By the time of the fifth infusion, it's all over for the leaf. Recognisable as leaves, which is a bonus, being 4-5cm in length. Many are still able to be unrolled, if seemingly a touch brittle. A fair shupu, crisp and pleasant. The most impressive aspect is the leaf, which is clearly Menghai shupu - they have put their considerable experience to good use. It doesn't really push the boundaries, though, being mostly "decent". Perhaps a touch expensive for what there is. Time will mellow and smooth it, but there doesn't appear to be a strong enough character to make this worth buying for the long-term. First of all, on behalf of both Lei and myself, some words of sincere gratitude to Chabei's JMcM for his very generous gift, pictured below. Though the exact provenance of some of the teas remain a mystery, we have named them after the containers in which they arrived - hence, today's tea is "dajindai", or "big golden bag". I should emphasise that this obviously isn't a real tea name! Vivid green, and in smaller balls - what British usually know as "gunpowder" (due to its appearance being reminiscent of gunpowder balls). This tea is a real trooper, as you can tell from the infusion times. I can't remember the last time a tieguanyin has lasted so long, which is often a good indicator of quality. The first infusions look like lime cordial, being translucent green, while later infusions take on a fresh yellow-green appearance as the leaves begin to assert themselves. A distant voice from the kitchen says, "Mmm, beautiful! I can smell it!" The aroma fills the room, being a potent example of the classic buttery-floral, sweet scents of tieguanyin. The lengxiang is similarly enduring, and is of brown sugar. The flavour is unhurried, full, and rich. Building like a wave from a quiet appearance at the lips to a full-bodied, sweet finish in the throat, it ends in a mouth-watering huigan. The texture is smooth, and the flavours are well-integrated, and balanced. In the final infusions, as the brew is stretched, the qualities of the underlying leaf make themselves apparent, being simple and "tea"-like in their sourness. The huigan stays until the end. "It's good, isn't it? Tieguanyin is so thick and sweet - delicious." Small spring leaves, thick and healthy. 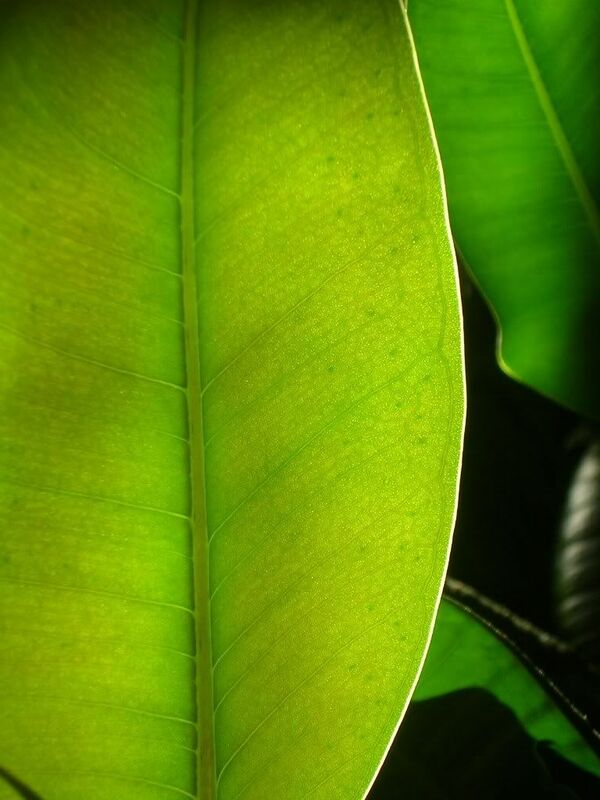 The edges are all basket-bruised, as used to promote oxidation in the leaf. A classic aroma, with a bass, smooth flavour that, as a Scot, I'm sure JMcM will know what I mean when I describe it as "butterscotch". A good quality texture, with a solid huigan makes this a very pleasant experience. Thanks once again for the very kind gift - a real pleasure. I thought that I was deterred from ever considering molihua [jasmine flower] tea after being subjected to horrifically unpleasant versions of it from (Anglicised) Chinese restaurants and ethic-free supermarket chains. Invariably, these teas were scented as cheaply as possible, using heavy jasmine oil, which also had the happy side-effect of allowing the producers to use even more terrifying leaves to make the tea than they usually would. It is safe to say, Western "jasmine tea" is pretty much the bottom rung of the ladder in my estimation, right next to Tetleys/Typhoo/PG Tips/Lipton teabags. You can well imagine my reaction when Lei produced a small container of molilongzhu [jasmine dragon-pearls] from her recent trip to China. Always happy to be proven wrong, and trusting Lei's constantly fine judgement in such matters, we sat down to a jasmine-scented session. These were 18RMB/50g [~£1.30, $2.50] from her hometown. Tight "pearls": perfect spheres with streaks of silver interwoven, from the tips. The aroma of actual molihua (rather than the tell-tale artificial scents derived from oils) radiates from the leaves, and the small cylinder in which the tea is stored has taken on the strong aroma. "Don't be misled by the low price", sayeth she, and I nod sagely. This is an 8 a.m. tea. It is raining hard outside, as it has for many days (resulting in much flood damage and untraversable road) across Oxfordshire. The leaves of the bushes and the petals of the pink flowers outside the lounge window are heavy with raindrops. We huddle around the tea-table and set about greeting the morning with our tea. Judging from the infusion times, this tea seemed to have a certain endurance you might surmise, and right you would be for it lasts a particularly long time - this is a novelty for molihua lucha, in my (previously-recounted) horrific past experiences. The hulu [gourd-filter] is entirely redundant as there are no stray particles from this tea at all. 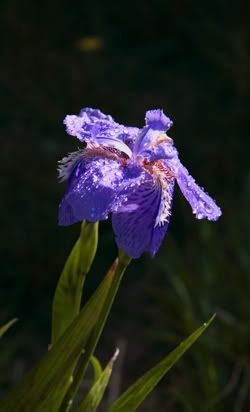 The smell of rain-washed flowers from outside mingles seamlessly with the similarly floral aroma from the gongdaobei. The brew is solid yellow, and there is an interesting "low" flavour under the expected floral character, something like rich nectar. The overall impression is solid lucha mixed with, dare I say it, "Hubba Bubba" - the chewing gum from the 1980s that I used to enjoy as a child. It is the precise, exact flavour of Hubba Bubba. Thunder rolls, and rain falls loudly from the gutters, front and back. It may be of interest to note that I tend to brew lucha without the gaiwan lid, following advice obtained independently from sources in both Lei's hometown and on Maliandao. I have not yet run a qualitative comparison, but it does seem to assist in avoiding "stewing" - simply because of the lowered temperatures, I assume. Bud, tips, and a few leaves, all joined by the stem and rolled up tightly. Very attractive indeed - and a good grade, hence the high price (relative to the cost of other goods in Henan Province). 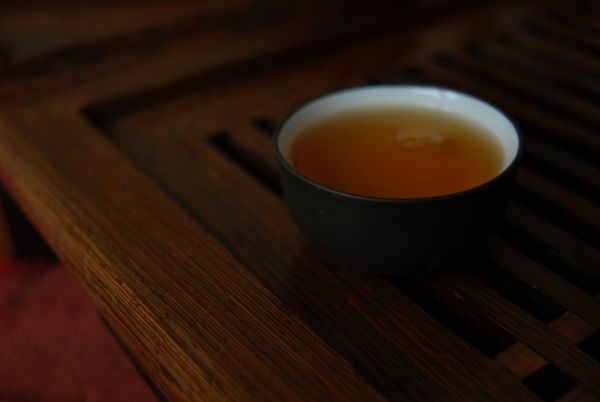 "I can see why hardened tea-drinkers might think molihua as being simple, but it is lovely." Indeed it is, accustomed as I am to the palate-numbing excesses of English supermarket jasmine. This is good tea, and again I quietly note to myself that Lei really does know how to buy a fine leaf. My prejudices to molihua lucha are shaken. The Baxian [8 spirits/Gods] are the subject of Chinese mythology, a collection of disparate personalities from the Tang and Song dynasties often revered as deities (particularly by latterday ritualised Daoism). They are often encountered in Chinese painting, usually being depicted as crossing the great sea in a small boat. Their connection to dancong is not immediately clear to me. 3-5cm dark, twisted leaves with one or two small, flat leaves (also oxidised to dark brown). The aroma is that of sweet grapes. The soup is a concerningly pale yellow-and-green, and this fear is born out in the aroma and flavour which are fairly quiet. In its beidixiang, it is very much a gaoshan wulong: buttery, with just the right amount of roasting making its way into the scent. 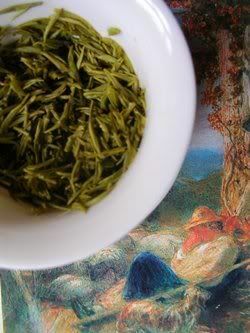 The fruity finish beloved of dancong fans appears as regular as clockwork in the lengxiang, and pleasant it is. "So fresh! It has a herb-like character." The conjunction of fruits and roasting does provoke the impression of the more floral herbs, such as thyme and rosemary. "Too light - insipid." The tea doesn't carry well into the later infusions. It is gentle, sweet, floral, but ultimately fairly mundane. Fragile and hard to unroll, I wonder if these are summer leaves, further suggested by their size. They are quite green, and the oxidation level is constant across the surface of the leaf, rather than being bruise-oxidised at the edges and stem. I wonder if the roasted-fruitiness is signature baxian - I simply have not encountered enough to create a firm prior image of this type of dancong. It is a refreshing mixture of gaoshan wulong with a good roast, but doesn't excite too much enthusiasm. Long-time readers will remember one of the reasons for the existence of this web-site is to provide a searchable history of the tasting notes generated by Lei and me in our tea explorations. Of course, perhaps more importantly, by making it in a open format we hope that the articles might prove of some small use to you, Patient Reader. Certainly, the comments and discussions provided by the readership are as vital to its continued value as are the basic tasting notes. To that end, we would very much like to take advantage of the "poll" functionality offered by the web-site to see how well matched the site's content is to most readers' interests. If I could trouble you to briefly cast your eyes over the poll to the upper-left of this page, I'd be very grateful for your feed-back. The Chunming [spring bright] factory has been in operation since 2000, and we previously encountered their products in the 2005 Chunming Nuomixiang [glutinous rice scent] shupu, which was rather pleasant - if unorthodox for obvious reasons. 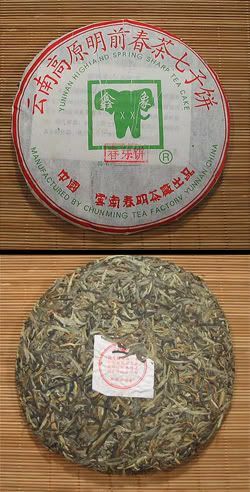 This chunya [spring tips] bing looks rather similar to a yinzhen [silver needle] pu'er cake, being made of small, silver tips. Thanks to VL for this sample, the original bing sells for an entirely inexpensive £2 [$4] from Royal Pu'er. Small, spring tips mixed with other small, dark leaves. There is a sweet aroma about the sample which is most pleasant. "Forewarned is forearmed", and the vendor's web-site lists comments from previous buyers describing how using more leaf provides better results - hence the big pile of leaves in the chahe for this session [pictured]. From the infusion times, you might assume that the tea has some strength and endurance to offer, and you would be correct to do so! The soup is amber-gold, with a gently sweet aroma about it. The flavour is actually rather pleasing, consisting of a basis of mushrooms with overtones reminiscent of a decent baicha. 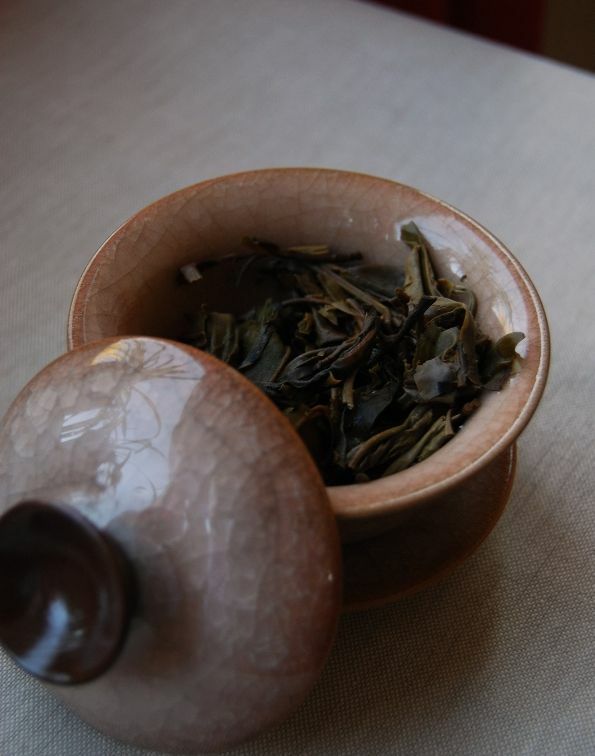 There is a touch of dianhong about the entire affair, perhaps imparted by the dark, oxidised mixture-leaves. "This is very tender; we should get some." The huigan is light, and the flavour has a certain smoothness - not the extravagantly luxurious smooth texture of some yinzhen cakes, but certainly appealing. Later infusions show its roots as a young shengpu, and a touch of greenness begins to show through - though this tea never cracks with later infusions, rather tending towards a straw-like simplicity. It is constant and simple. Generally decent: as noted previously, it is a tippy grade mixed with a low-grade stem-and-fragment set of leaves. Perhaps, like the 2006 Yibang Chamasi, this is a quiet surprise: it is decent, enduring, and doesn't crack under pressure. It responds well to using very large quantities of leaf, and our experience lends itself to recommending that one shouldn't be too conservative with the brewing times. 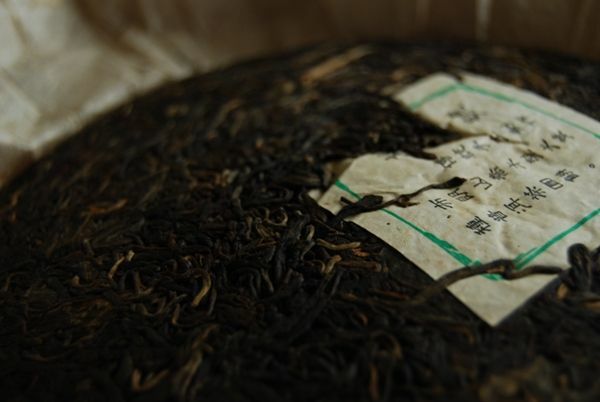 It is a simple mixture of creamy tippiness atop a basis of fair pu'er flavours. It won't change your world, but for the almost negligible price, it's hard to find fault with this simple yet pleasant little fellow. Don't buy it to age, but it might prove an interesting diversion within its class. I shudder with terror to think what tea £2 would buy me in an English supermarket. Following a second sample of biluochun sent by TeaCuppa, I have added some addenda to the previous 2007 Biluochun notes. A sample left-over from the community tea-tasting session several weeks back, this maocha is for sale from TeaCuppa for £7/50g, making it fairly expensive. The samples from this company have received a mixed reception, both from me and from other tasters, and so I make an especial effort to clear my palate for an unbiased tasting. On snipping off a corner of the sealed foil bag in which this sample arrived, the unmistakable fruity aroma of maofeng escapes - is this a "green tea" pu'er? This maocha is serious in size, being 7-8cm stems with one or two leaves attached to each. Colours range from light to dark green. The maofeng aroma is distinctive, radiating from the chahe. A solid yellow soup with a hint of green. The aroma is sweet shengpu, and yet the maofeng character is present in the wenxiangbei. It fades to a lengxiang of brown sugar, which for some reason I have taken to being a good sign - many of the poorer teas I've come across seem to be devoid of any lengxiang. The tea itself is interesting: it has an oily smoothness that I usually associate with good leaves. The flavour is gentle, reminiscent of the oft-encountered set of straw tastes. Despite attempts to overbrew this tea, there is no ku in it whatsoever. The flavour is fairly muted, but pleasant enough. Of interest is a fair huigan, which rises like a crescendo in the throat. Given the usual potency of banzhang leaves, I am surprised that this has no ku at all. Outrageously beautiful. I love to look at good maocha, and this certainly is pretty: young, healthy, and vibrant leaves with whole tip-and-bud systems are to be found. Fair enough, but where is the potency? This is a very gradual and drinkable tea, and I am surprised that one can find maocha (particularly banzhang maocha) that is missing its ku. When the price-tag is brought into the equation, this doesn't deliver enough strength or variety for my personal tastes - though what it does is pleasant enough. Here's an interesting factory, an entirely new one on me. Thanks to TeaLogic's VL for the sample. Shortly after the Nanjing Treaty of 1842, the Qing court set up the Chamasi bureau in the region of Yibangshan, the tallest of the six great mountains and the centre of the region's tea industry at that time. It controlled collection, production, and distribution (particularly to the Imperial family) until the decline of the 1890s, when production moved to Menghai. The descendants of the family responsible for the Chamasi bureau apparently returned from Indonesia to China in the 1970s with the aim of reviving their ancestor's organisation. Three major shareholders joined for the refounding of what became the Xishuangbanna Yibang Chamasi Company in 2005. I notice from the product web-site that VL found this tea to be "a bit peculiar". It looks rather nice, in fact: dark, small leaves with some tips, and plenty of fur throughout. 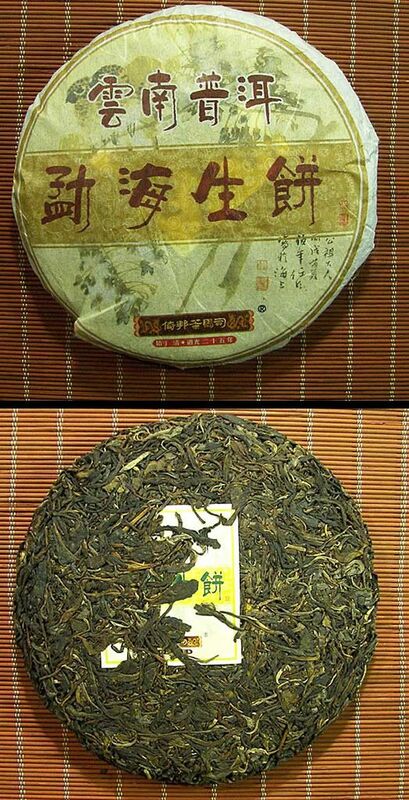 It has a sweet, highly typical mushroom aroma that I have come to associate with Menghai-region leaves. First impressions are favourable, at least. Light yellow soup, made cloudy by the fur that we noted on the dry leaves. 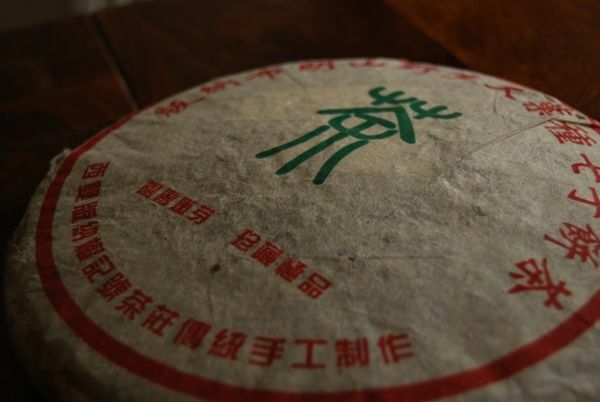 It has a gentle, sweet aroma in the wenxiangbei which is really little more than warm air. The flavour is a touch thin, but what there is hits the "sweet mushroom" category with little equivocation. The ku hovers just off-stage, for now - identifiably present, yet kept at bay by the very brief infusion. It isn't a good tea, but it isn't explicitly bad in any regard: given that it lies soundly within the "very cheap" league, it manages to avoid all of the usual pitfalls that other in its class usually fall into (roughness, sharpness, astringency, poor production). The feeling in the mouth is fairly neutral, but there is a fair and gentle huigan awaiting the patient. This tea is bright with a heavy payload of caffeine, which hits me directly between the eyes. It really is very strong in that regard. The lower grade becomes obvious as we turn out the leaves into the chahe: generally small, but quite chopped with more than a few stems. It could almost be Xiaguan, or Chen Guanghe Tang. However, unlike those teas, this is a cheap tea, and the low grade is anticipated. A fair enough tea, which does not offend or fault in any real fashion: it is gentle, sweet, and quite timid in flavour (packing a hefty amount of caffeine). However, when we then take its highly inexpensive price into account, its lack of faults might make it tempting. Given that a cake of this fair if uninspiring tea costs less than two hideous coffees from Starbucks (or those of its ilk), it's not a bad little tea. Certainly not peculiar, to my tastes at least. I won't be buying any of this particular tea for myself, but I look forward to trying the more expensive (£10) Gedebao bing from the same company, recommended by Geraldo. This tea taught me a great deal. Brewing many types of lucha is easy, as it can be fairly forgiving. Xinyang Maojian ["furry tip" from the Xinyang region] is not one of these teas - it is very unforgiving. Getting the best out of this tea required experimentation, but the results were rewarding. In its fickle nature, but not in its flavour, it reminds me of many Japanese teas that I have ruined in the past. First of all, why should we bother? The answer is this tea's status as one of the Shi Da Ming Cha [ten great teas]. Arguable and indefinite as this list might be, that it always contains Xinyang Maojian is testament to its perceived quality in the eyes of tradition. As regular readers might recall, Lei is from Xinyang territory (in central Henan Province), and the majority of her local tea-shop is occupied by varying grades of this leaf. For the purposes of education, we compared a low, "daily" grade (25 RMB/50g - approx. £1.50 or $3) to the very highest grade (60 RMB/50g) - both of which were designated "organic" by the shop owner. "Don't be misled by the apparently low prices - this is very expensive tea for Henan." Lei recounts her happiness of the time she was browsing the wares in the tea-shop when a local farmer-worker [effectively what amounts to a "peasant" in the difficult economy of rural China] came in to buy Xinyang Maojian. She was deeply impressed that appreciation of good tea cuts across all social classes. I often remind myself what low calibre of tea the general populace of England will accept, despite their relative affluence, and look on the farmer-worker with a similar degree of sincere respect. "Money can't buy good taste", they say. In the photographs, the top grade and bottom grade appear on the left and right, respectively. The top grade is all tips, and is a beautiful, gentle green. The low grade is cut with some darker, larger leaves, and contains more fragments. The illustration shows a yellowish tint to the top grade, which is misleading. This tea is very easy to brew. Only a small number of leaves are required (~4-5g), and the flavour is the pleasantly sour, grassy character of some Xinyang Maojian. The soup is typically cloudy. It is very hard to overbrew or underbrew, and a generally pleasant flavour is obtained no matter what. The shopkeeper brewed this in the manner that the majority of Chinese drink their tea: a small number of lucha leaves, in a glass of hot water. This was the challenge, and the education. Brewed "conventionally", in my normal manner (~5g leaf in the gaiwan, with 80C water), the result was pure ku, with almost no flavour. It was deeply, sincerely unpleasant. This can be seen in the photograph, where the colour of the soup is a light brown, without much appeal. Well can be imagined the character of the pinmingbei [tasting cup]. Alerted by the overwhelming ku, we tried again with this tea during another sitting, using fewer leaves (~3g). The result was similarly unpleasant, and lacking in any charm whatsoever. For the third sitting, I treated it as a young shengpu: lots of leaves (~8-9g), with as short an infusion as I could (~3 seconds, after putting down the kettle, and putting the hulu [gourd filter] onto the gongdaobei). I used cooler water (70C). The result was exceptionally delicious. The ku had gone, and a beautifully rich flavour of flowers and wild grasses filled the mouth and nose. "This is amazing, it is just right. It is like a rich and delicious food, cooked perfectly." Suddenly, finally, the mystery disappeared, and the quality of the leaves shone through. It seems that good Xinyang Maojian is worth the effort, as it is disjoint in its character to many of the other lucha that we have previously enjoyed. The low grade was a fairly generic, grassy affair. The true charm came from the top grade, which filled the mouth with sumptuously rich flavours, and evoked an image of the flowering fields of a warm English summer, such as we are currently experiencing. I am grateful both for the opportunity to taste a good example of this genre, but also in evaluating the differences between the top and bottom grades, and in learning (with some necessary persistence) how to coax the hidden delights out of the expensive leaf. 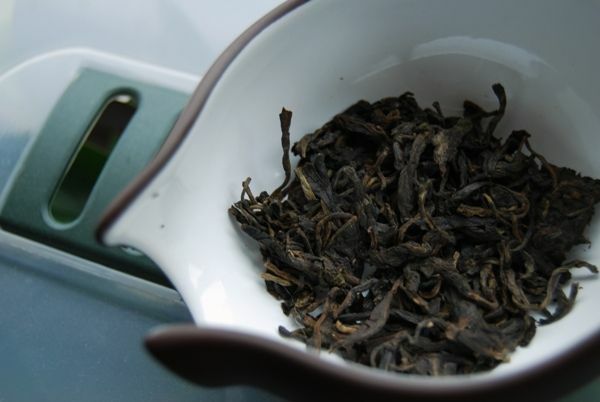 At £8/bing [$16] from Royal Tea Garden, this four-year-old bing is suspiciously inexpensive. This sample is from CB [many thanks]. Rich brown; quite chopped, with a few tips - typical Xiaguan small fragments. Sticky, sweet beidixiang, and a thick, orange soup, right from the first infusion. Rich, low fruits in the body, with some ku in the finish - this brings back a little sweetness in the huigan, but it is fairly astringent. The entire feel is quite thin and weak, but the astringency is enough (even with a short infusion) to be getting close to the "hairspray" previously encountered with the 2005 CNNP, though to a much lesser (and more consumable) extent. At least, the tea has not been processed to remove its ku and make it immediately drinkable - a process I often lament. Later infusions are what I suspect Lei would call "barbecued corn": it is dark, sweet, but remains fairly abrasive in its finish despite the rapid brewing. It's like some people I know: the initial impression is sweet. Then, there is some sourness and bitterness. It can feel rough and aggravating if too long is spent in its company. Believably Xiaguan, being a few torn, large leaves accompanied by great piles of fragmented mulch. This factory can make tasty tea, but they clearly have no intention of aiming for aesthetic appeal. The wet leaves smell mostly of menthol, oddly enough. Cheap, and not explicitly bad - but none too thrilling. It would be beneficial from an educational standpoint to try this in a few years, to observe the progress of the ku, and that back-end astringency. Quite antisocial in character, with a simple, dark fruitiness. This is probably worth the money... but that's not saying too much. This is the "Taihe" [supreme peace] shengpu bing from Zitenglu [purple thatched-cottage] Tea Factory. 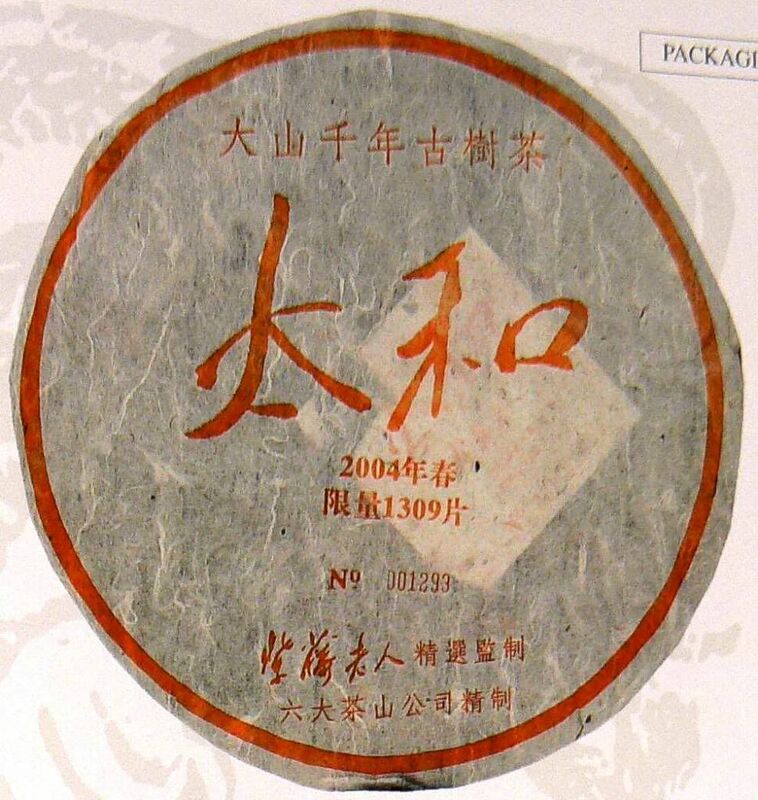 It is listed as "Tzu Teng Ru" in First Steps to Chinese Puerh Tea [pictured - thanks, VL], where it seems that it also makes claims to "Big Mountain" and "Thousand Year Ancient Tea Tree" status - take those for what you will, of course. Looking at the photograph of the wrapper, it clearly shows "Liu Da Cha Shan" company - I wonder if that is the eponymous "6FTM". This tea apparently hails from Zhuyu region, a harvesting area "close to Yiwu". The party that provided this tea [who shall remain mysteriously nameless] indicates that it is characterised by a lack of real flavour, but a very significant sensation in the throat. Big, flat leaves, with one or two truly whopping silver tips. A good, bass aroma of tobacco. All signs point to "yes", as that modern-day Yijing, the Magic 8-Ball, might say. On pouring out the first brew, I immediately think that this is one of those "brown" shengpu (for want of a better description), usually characterised by low, sour flavours. Sure enough, this is born out in the beidixiang, which is fully sour, turning nicely sweet in the lengxiang. So too, the colour of the soup is creamy brown. Alone with Mozart's Requiem, the body of this tea feels hauntingly empty - a great big, noticeable hollow exists right through the centre of the tea, sitting atop a quiet bass of sour "tea". True to form, as it impacts with the throat, a grain-sweet sensation erupts making my mouth water. The quality of the tea seems decent: it has a smooth oiliness, it lasts fairly long in the mouth and nose (patience! ), yet it remains highly odd and unorthodox. Happily, this kind of unorthodox is fine by my tastes. I celebrate my finding of a Cavalleria Rusticana libretto from the second-hand bookshop next to College with my classic DG recording, and this tea is a fine accompaniment: rustic and enjoyable. Around the fifth infusion, it becomes much simpler - but it is an ending that I enjoy, being that undercurrent of "tea" coming to the fore. Huge, whole, strong, green. Good stuff. A fairly basic tea, with a solid, sweet huigan. I would be happy to own a bing or two for the sake of variety. Amusing enough, in its special way. Four score and seven years ago, the Davelcorp Foundation brought on this continent a new tea sample, conceived by the Changtai Tea Factory... the 2003 Yichanghao from Yibangshan area. I dug back into my box of journal archives to find my original notes on this tea [pictured]. It's always interesting to read opinions and thoughts of a person whom you used to be, once. The changes are gradual between thither and hither, but they add up to quite a significant gap. 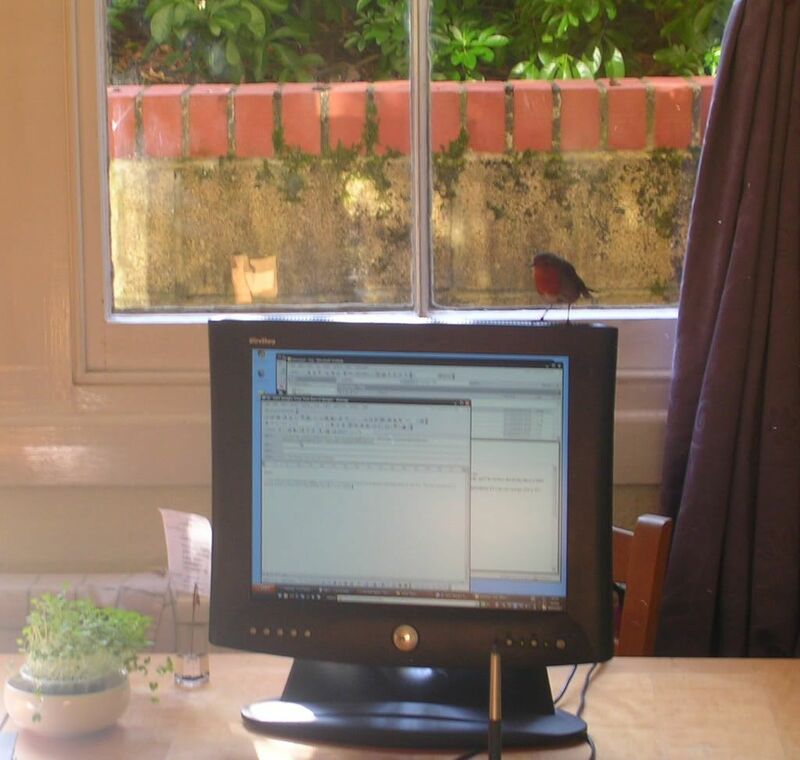 Go too far back, and suddenly what was once your own writing is now that of a complete stranger. My original notes on this tea from DL [thanks again, Dave] are halfway familiar, halfway those of a bemused stranger. What better time to revisit an old tea. This sample was sold by Houde, under the name "2003 Chantai Yichanhao Yiban" [sic; it looks like all the letters 'g' were mysteriously deleted from Houde's listing]. I noted at the time it cost $45/bing - I can't help but imagine how much it would cost today, around a year later, were it still available. Ranging from obviously green to pleasantly dark brown, the leaves are satisfyingly whole, and about 3-4cm in length. It looks decidedly healthy, and rather sumptuous. I always fall for good-looking leaves. There is a slightly aged aroma about the dry leaves, which reinforces my positive first impression. It's an orange/brown soup, and the flavour is correspondingly low and broad. It's one of those tobacco/mushroom teas, which are very appealing to my personal tastes. The ku is strong in relation to the flavour, which immediately makes me wish to try the tea again in five years. It is pleasant in the nose, leaving behind hints of shicang [wet store], along with a general straw, or sweet-grain, aroma. There is good oil present throughout the tea, which is something that I have come to appreciate. Later infusions take a turn for the sweeter, while the fourth infusion sees a marked transition into darker, fruitier territory. Happily, it is not the dark fruit of some of the "drink it now" teas that I have recently been drinking, but is combined with the potent ku that makes me wish it were still available for purchase. Healthy and whole, many still joined to one another via the stems. Quite thin, with the broad character hiding just slightly below the surface of the ku. Owners of this cake are possibly in for a fine time when it comes of age. [If you do happen to spot a vendor with this one, I'd appreciate your pointing it out.] Decent tea, and a good hope for the future. Very much "my cup of tea". Addendum: I came across notes on this tea from TeaLogic. One of the great aspects of tea that, for me, elevates it to the heights of wine and cheese is its variety, and the fun to be had in the exploration of its fascinating sub-genres. Long-suffering readers (bless you) may recall my encounter with one of the corners of the tea-map, the 2006 Huangzhixiang dancong from TeaCuppa. Today's tea was obtained by CB [thanks again] from Royal Tea Garden, and makes for a potentially informative repeat visit to this most curious instance of the dancong area. Was the TeaCuppa tea an oddity in itself, or is the huangzhixiang genre really that unusual? This "second opinion" is of great interest to me, in building up a so-called tasting memory for the various dancong types. For notes on huangzhixiang [Cape Jasmine scent] dancong itself, I refer you to the previous link. Twisted, 3-4cm, with a few stems. This is the "second grade", sold by Royal Tea Garden. Mostly dark, with some more lightly-oxidised parts. A light, sweet, floral scent hangs about the chahe. Remarkably, this does in fact behave similarly to the TeaCuppa example: it has a sweet, caramel beidixiang, followed by a candy, white-sugar lengxiang - I rather like it. The soup is bright and yellow. This has none of the frontal ku of the TeaCuppa leaf - here the power remains at the back of the throat, and it makes for a more enjoyable tasting experience. However, the unusual combination of dainty flowers and punchy ku is very much still present, making me wonder if this is the true characteristic of the genre. It is lightly floral in flavour and scent, reminiscent of small, unforceful flowers of which the huangzhizi is a type. It has a smooth body, which is quite thin. It turns a corner after the third infusion, which gradually fades gracefully, without the feeling of breaking apart that afflicts so many lesser teas. I notice that my tendency to get impatient with floral dancong is abating, and by consistently being conservative with my infusion times, this tea stretches well to seven infusions. Usually, I start increasing the brewing time once it "turns the corner", and invariably end up with a fairly strong finish which often cracks apart. I'm learning to treat these end-stages of dancong more carefully. Not the best grade, nor the worst. Quite fragile. Good for the price, because this is a very inexpensive tea - it's not outstanding, but it's pleasant. A fascinating extension to my tongue's ability to navigate through the maze of dancong varieties. We don't drink a lot of tieguanyin - not through design, or preference, but just by happenstance. Most of my qingxiang wulong time is spent drinking Taiwan gaoshan leaves, just because that's what we happen to have in the cupboard. It's time to get back into the company of this oft-delicious Anxi speciality that I have neglected so thoroughly. If you have a decent tieguanyin that's available from Internet vendors, I'd appreciate your recommendation. From Lei's hometown, this tea is 60 RMB / 100g - around £4 ($8). It doesn't sound too terrifically dear, but given the low rural prices from where it came, it's relatively expensive. Very expensive, for a 2007 anything in Lei's hometown, in fact. This forms a fairly strong prior assumption about the tea's quality in my mind, which I try to temporarily dispel for the purposes of unbiased tasting. Loose, heavy spheres of tea - not too tight, with a few fragments evident. Super green, almost too green, fitting the fashion for light roasting. The aroma is bright and energetic - typical tieguanyin. This is a seriously tenacious wulong - as you can no doubt tell from the infusion times. The soup is very clean and clear - a light yellow-green, like a dessert wine. The first few breaths from the wenxiangbei remind me how much I miss good tieguanyin. Those first sniffs are distant, full, beautiful - buttery, lightly spicy, becoming ever sweeter as they fade. It's easy to see why the opening aroma of qingxiang wulong is so popular. This tea is rather unusual: each infusion was almost perfectly brewed. The balance of flavour, aroma and texture is just right: not too sour, not too sweet, not too strong, not too vapid. Spot on. I'm sure it's just a sociable leaf, rather than anything to do with my efforts. Oiliness abound, the pleasing and typical almost almond nuttiness of tieguanyin sits seemingly forever in the nose. Great stuff. One remarkable quality of this particular tea is its ability to pass through the mouth almost without resistance. It reminds me of an old Daoist line, in which we are told to walk lightly on the earth, leaving no impression. This tea does exactly that: the liquid feels like an invisible medium, intended only for the transmission of flavour and aroma. The actual characteristics of the fluid are almost undetectable. I breath the tea deeply into my dantian, and wonder how this tieguanyin can stand more than eight infusions. Thick and tough, they are entirely unexpected given the almost ethereal qualities of the soup. 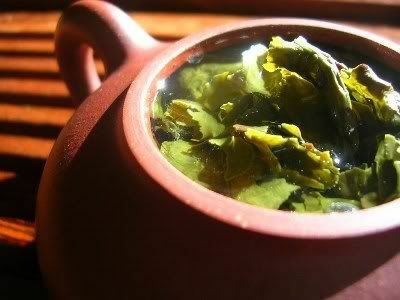 It is quite surprising that such robust, almost untearable leaves, could result in a tea quite so gentle and pleasant. Sadly, we have just 100g of this tea. Perhaps that's a good thing, as it will oblige me to explore other tieguanyin out there, rather than sticking to one favourite. Robust, enduring, and for the first few infusions at least, truly lovely. 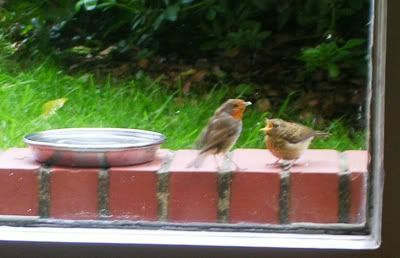 Uninvited but welcome guests were to be found at my desk this morning! I recently had a good question regarding the term "patience", which I thought might be a topic of interest for other readers, as it's a word that crops up in my journals, and so in these articles. I originally use the term as part of the vocabulary of cheese/chocolate tasting, funnily enough, and now tea. In each of these tasting spheres there is the concept of initially-sensed flavours that gradually move towards sensations at the back of the mouth. The way I’ve seen the term "patience" used is to characterise the duration of that progression through the mouth. The tacit assumption is that it is good to have a lingering, unhurried process from "lips to throat" (from "head" to "body"). Substances that are "patient" show an unhurried progression: they last a long time in the mouth. Conversely, it’s often unsatisfying when a substance "hurries" through the mouth: a quick initial flavour, some mid-flavour, then the throat (and huigan in tea). We’ve got plenty of teas (and am sure you have, too) which rush in and rush out – often these have little "low" notes flavour, as it is these that tend to dissipate the slowest. The knowledge accrued by perfume manufacturers and wine producers over the centuries (and no doubt some tea factories) is that the "high" notes are sensed first, and dissipate first, while the "low" notes are sensed last, especially around the throat because of the interaction of the nasal cavity, and dissipate last. In the ways I’ve seen the term "patience" used, it’s not an assessment of flavour – it’s only an assessment of the duration of the progression through the mouth. We’ve got a tea (which shall remain nameless) that has great patience in that it lingers for a long time, and yet tastes like poison. 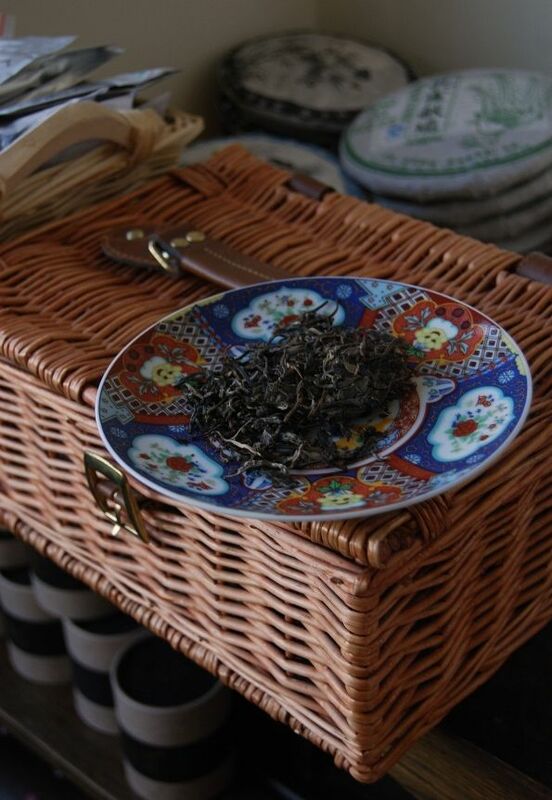 We’ve also got teas (plenty of wulong, typically) that have great, rich flavour but which have nearly no patience. Finding a "patient" wulong that still tastes good, and furthermore has the "endurance" to last many infusions, is one of my unofficial goals in tea. Some of the best cheeses in the world (thinking epoisses, if you like cheese) have exemplary patience. A prime differentiator for spotting a factory-cheese from an artisan-cheese is in its patience – there must be parallels in tea. It seems a fairly intuitive term. I was at a wine-tasting where one wine was described as "wonderfully patient", which the assembled host seemed to accept without question. I wonder if the Chinese term is a transliteration from the English? Or mere coincidence, perhaps. What is your understanding of "patience", particularly when related to tea? Hopefully, this goes some way to describing its use in my tasting notes, at least. This sample of 1993 shengpu maocha from the Davelcorp Foundation really snuck in under the radar, being an accompanying sample to the 2001 Mengku Gancang (thin-paper). And by the power of Greyskull, what decent tea it is. DL mentioned that this was an unsung hero from a local vendor, of origin unknown. Dark and chocolate-coloured, looking rather like dahongpao in its "huskiness". Fairly whole leaves. Some stems, a few tips, but mostly dark mid-length sections. A slightly damp aroma testifies to a little wet-storage - the overall effect is very attractive, and I chuckle aloud to myself at DL's ability to quietly sneak in great tea when you're not looking. The first impression is the delicious beidixiang of absolute vanilla, with the complementary shicang [wet store-house] sweetness of the dry leaves. The sensation in the mouth is ineffably smooth, with plentiful oil on the lips and tongue, and a "heavy" texture to the soup. The flavours are sweet, fairly high, and remind me of creosote and wood-stain, in an appealing way. There's not a lot of bass, low flavours on offer, and what is present is a touch understated. It is likely that this is due to the fact that it's maocha, which I find has problems with retaining its flavour over time - it attains a richness and depth, but then begins to thin out fairly rapidly. I am reminded of the 1960s Gaoligongshan maocha - smooth and delicious, but a touch underpowered. As with that tea, this 1993 maocha benefits from large leaf quantities and less conservative brewing: one can afford to bully the tea a bit, in order to extract the best flavour. It lasts long in the mouth [patience! 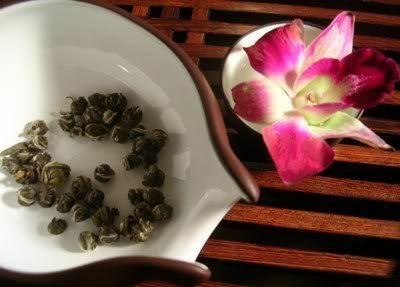 ], and finishes with the combined pleasures of its woody sweetness with the shicang aroma in the nose. There is a hint of salt-like flavour in the huigan. Dark, but strong and healthy - they are easily unrolled. Mostly small leaves, some joined at the stems. 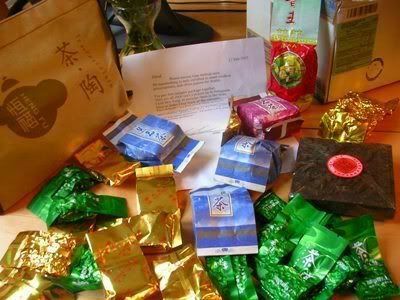 It is not the huge, voluptuous modern maocha that we see and admire so often. Many thanks to DL for this sample - it was excellent. Satisfying in flavour, aroma and body, it takes leg-work to keep up with, but amply rewards while its endurance holds out. Previously, Perplexd asked about timing brews, which I thought might be worth a more general answer as it's an interesting topic. As ever, I don't claim to have "The Answers", because there are no definitive answers. What I present here is merely my opinion. *There are as many methods of timing infusions as there are brewers of tea. I've seen some brewers use an electronic timer, some count breaths, some use intuition. These are woeful generalisations, and like all generalisations do not describe the full range of human experience. I'm sure there are master brewers out there that use electronic timers, and perhaps there are beginners who can make great tea, every time, using intuition. I'm quite Japanese in my outlook about the use of intuition in producing good works: repetition and hard-earned experience are, in my eyes, the pre-requisites to truly harmonious skill - archery, calligraphy, making tea, computer programming. There are good books on the "Zen" of each of these subjects. This movement from the initial use of measuring-devices culminating in the use of intuition seems to hold for all aspects of tea: there are many variables, and the best brewers I have encountered have an innate mastery of this highly dynamical process. They've learned it through experience and sheer dint of hard work, but the result looks almost effortless. Again, this is a well-documented process in many areas of human endeavour - perhaps even all areas. The solution? Brew more tea. Like the archery student that misses the mark a million times before learning the Truth behind the shooting process, the way to making great tea every time is strewn with undrinkable, vile infusions. Making bad tea should be a cause for celebration - it means one is getting closer to making good tea. Hail to the stems. Larger, more whole leaves than its cousin [the 2003 Quanji Bulang]. Even the tips are darkening. Sweet, pleasant. Dirtier than the bulang, but sweet and green in the wenxiangbei. Very mild, not delivering much strength. The colour is richer orange, with a mintiness on the lid and in the leaves. The flavour is very quiet, with very little bitterness - even with longer infusion. It has good chaqi, making my skin flush. It has the dried, sweet fruitiness of the 2000 Jingyehao Yiwu and the latter stages of the 2004 Changtai Yiwu, which makes me think of processing oddities (either deliberate, to make it more immediately drinkable, or unintentional). Later infusions show some biluochun-style greenness. A touch of ku in the finish does at least show that this is, indeed, pu'er. Even in attempting to overbrew this tea, it is never bitter and is more like warm fruit-juice. Dan cong-style colouring. An intriguing blend of very large, tough leaves and tiny spring leaves. A novelty, and fun to drink before Mass. Allegedly Yiwu leaves, but MarshalN (and the vendor from whom he obtained it) are skeptical. It's hard to tell, given the processing. I can't recall ever coming across a "modern" CNNP that I truly enjoyed, now that I think on it. A sample from MarshalN, I wrote the original notes for this tea around a month or so ago, when the tasting took place, but have since come back to this tea with different brewing parameters. In fact, this tea was a turning point in my brewing of young shengpu. I'm sure that this is elementary for most readers, but it wasn't immediately obvious to me at the time, so I'll briefly recount it here. Prior to this event, I tended to be fairly conservative with leaf quantities of young shengpu, assuming that this would keep the bitterness (kuwei) in the young shengpu down to a palatable level. It seemed intuitive that reducing bitterness implied using fewer leaves, or more water. I tried both. However, I found that I wasn't picking up on a lot of the complexities in the tea. Following MarshalN's advice, I took the counterintuitive step of using lots of leaves (~7-8g instead of ~5g), but brewing exceptionally quickly. Pour the water into the pot, put the kettle down, pour the water out - total elapsed time ku under control, but had the very pleasant side effect of conveying the full complexity of flavour right from the outset. It also had the very unexpected outcome of also conveying the texture of the tea (light oiliness, perhaps, or thick tippy body), which I had assumed would be obscured by the brevity of the infusion. As I say, I'm sure this is elementary for most, but it took me a surprisingly long time to overcome my instincts about using lots of leaf. My 12cl young shengpu pots are now pretty much filled with tea at the end of a session, and the result is a more informative experience of the leaf's particular qualities. A good grade with plenty of white tips, a sheen over all. An aroma! Sweet and dark. Not unlike my beloved 1998 Menghai "Peacock" tuocha. No smoke, very little aroma - contrasting with my original brewing method (fewer leaves, 15s infusion) which resulted in excessive smokiness. Amusingly, both Davelcorp and I noticed "male urine" in the aroma using the original brewing parameters, which is entirely absent with the newer infusion method. The kuwei is no longer overpowering, but forms a pleasant end in the throat. The body is fairly thin, though there is a pleasant mushroom set of tastes, again similar to the 1998 Menghai Peacock. The texture is smooth and decent, with good oil on the lips. The overall effect is very calming - it left me soporific for an afternoon of listening to speeches and lectures. In later infusions, the wenxiangbei suddenly develops to give a fine, sweet aroma. There is fair patience in the mouth. It is worth noting that the soup is murky. Mostly small; some whole, but the majority are broken. Very healthy leaves: supple, healthy, and green. They are quite dirty: black specks and tar-like residuals may be seen [pictured]. A transformation from a grotty, unpleasant affair into something smooth and enjoyable. While fairly "high" in flavours and aroma, there is a decent range of basis flavours to make it a worthwhile cake. Though the chance of ever encountering this tea again is almost nil, the experience gleaned from changing my brewing methods of young shengpu is of much greater significance. MarshalN recently sent me another sample of this cake (thanks again! ), but it was a "blinded" tasting session. The leaves (pictured above) appeared to have some age, as they had something of a dusty red about them. Absent any scent, it is a heterogeneous blend of mid-sized leaves, slightly broken, with some stems. Recently, I've been catching up on trying various 2009 pu'er, and so this sample, with some age about it, was a very welcome change. The colour of the soup had a very pleasant deep-orange centre, with a chunky, heavy scent in the aroma cup. After an infusion or two of some reticence, it awoke to become sweet and woody, with a nicely full body. In the nose, from the first infusion, were hints of maltiness that reminded me of the wok - turning out the leaves at the end (shown below), it appears that around 10% of the blend in my sample comprised red, heavily-wok'd leaves. This was just a minor component, with respect to the general sweet woodiness, but present from the start nonetheless. On learning that this was the "male urine" cake, I was delighted to see that it had aged so well. Mr. N is clearly doing something right in his storage. I recall that same Mr. N terming cakes in this 5-10 year band as being "drain cleaners", falling neither into youth nor maturity. However, without meaning to be contrary, I find them to be some of my favourites for exactly that reason: they have had the brusqueness of youth eroded and mellowed to some degree, with woody notes present, and yet they still retain some of the vigour and challenge of their earlier days. A thoroughly enjoyable trip down memory lane. P.s. this tea is pronounced "ch'uan-gee", not "kwan-gee"! Dear reader, allow me to regale you with tales of further Taobao adventures. His Grace, the Duke of N was kind enough to point me in the direction of a Taobao source for the esteemed, nay almost mythical, "male urine" cake of bygone posts: the 2003 Quanji. A little over three years ago (for which I refer you to the start of this page, above), I wrote that "the chance of ever encountering this tea again is almost nil". As fate would have it, I've since enjoyed it again, courtesy of anonymous samples from His Grace, and now, with a cake of mine own. I've also observed an interesting characteristic in myself: I tend to appreciate cakes more when I own them. This doesn't always work - there are more than a few cakes that I own that I can't really claim to enjoy to any great degree - but it holds true most of the time. There is something about handing over one's hard-earned sheckles that softens the mind, tints the lenses, and sweetens my opinions. I am glad to read from studies in everything from experimental psychology to wine-tasting that one's a priori disposition actually changes perception. You think you're going to enjoy something, and you consequently perceive it as enjoyable. I try to keep an open mind... but, hey, I'm just human*. So, I now get to fawn over my very own cake of this perennial charmer. I've not actually seen its full, naked self before, which is rather a treat. The leaves are small, in the manner of the old school, and the aroma is of gentle, dark tobacco. The leaves are already rather dark, too. I was rather taken aback by the mighty compression - the samples that I have previously received have already been separated, and rather well, it seems, for the cake itself is very tight. It's not Xiaguan tiebing, nor 12 Gentlemen, tight, but it's tricky nonetheless. I christened my "tea pick" with this session - a long spike of metal kindly provided by either Keng or my last Taobao purchase. I am pleased to report that this cake remains very nice indeed. It's not premier-league stuff, as you will anticipate for a cake that costs a mere 188 RMB ($27), but it is worth the money. I became a little nonplussed with this tea at one time, but have since found that it reacts rather well to using lots of leaves. It is spicy, spicy wood - sweet like old varnish. It lasts well, and manages very well for a tea of its age and price. I bought this from 一团和气 - the Yituanheqi Teashop (which roughly means "to keep in favour with everyone"). It's worth a flutter, if you're already buying elsewhere on Taobao. I don't think that I'll buy more than my one tester cake, but it is a pleasure to own it - if only for old times' sake. I'm a sentimental fool.